Brian Burke, president and general manager of the Toronto Maple Leafs, announced Wednesday that the hockey club has signed free agent goaltender Ben Scrivens to a one-year NHL entry level contract. Scrivens, 23, was a finalist for the 2010 Hobey Baker Award, given annually to the NCAA’s top player. The native of Spruce Grove, Alberta was also a first-team All-American this season and won the ECAC Hockey Ken Dryden Award as the league’s top goaltender. 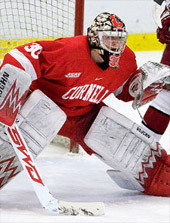 In 34 games with Cornell University in 2009-10, Scrivens led the NCAA in shutouts (7), save percentage (.934) and was tied for the lead in goals against average (1.87). He also recorded the third longest shutout streak in NCAA history, going 267:11 without allowing a goal and blanking Harvard, Brown and Union over that five-game stretch. The six foot two, 192-pound netminder finished his four-year collegiate career as Cornell’s all-time leader in shutouts (19), saves (2,873) and games played by a goaltender (117). He also finished tied for first in wins (65) and was fourth in both goals against average (1.93) and save percentage (.930).